The German mentality has the presupposition that everything sacral is accompanied by much calm and recollection. We see the full application of this when it comes to the celebration of Christmas. The Germans celebrate Christmas, for example, different from the Italians. 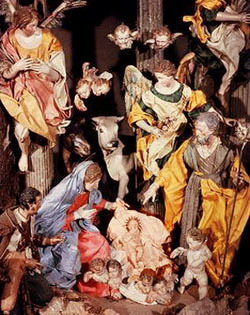 You know that there is a tradition in Italy for each church and neighborhood to have a Crèche and to compete to make it the most beautiful. If we look at the Manger scenes in Italian churches or cities, the figurines have very emphatic attitudes and gestures. 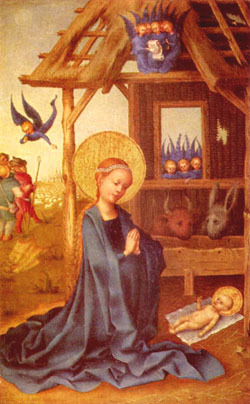 Thus, the Divine Infant lies in the Manger with His arms extended toward Our Lady. Our Lady bows over Him with an expression of overwhelming tenderness, manifested in gestures. St. Joseph is either jubilant or almost weeping from emotion – as expansive as possible. All the personages in the scene are so expressive that they seem on the brink of speaking. This fits well with the Italian mentality that believes religious emotion must express itself with great vivacity, an exuberance that must be represented with warmth – the warmer the better. This is the opposite of the German conception of Christmas Night. For something to be sacral, the Germans think that it must make a profound impression. Because it is profound, it should not be showy or external, since the deepest fathoms of the soul must be expressed through silence and recollection. While for one mentality the gesture and word constitute the apex of expression, for the other the summit of expression is a type of silence and stillness, which reveals the deeper aspects of soul. Through silence, the soul demonstrates its incapacity to express the richness of what it feels. It shows a position of soul that is more meditative than active, more recollected than expansive, a position that leans toward philosophical and theological reasoning. It is not, however, a cold and scientific calm; on the contrary, it is profoundly tender. It is such an unfathomable tenderness that the Germans choose to be silent rather than to talk. Therefore, some peoples express their eloquence by word and gesture, and others by silence and recollection. Among the Germans, a song will often begin serenely, the voices singing pian pianino [slowly and lightly], and then begin to crescendo until they end in grandiose Wagnerian notes. However, the Latin temperament – of which the Italian is the most characteristic – prefers the music to begin with it greatest vivacity. Which of the two is best? I understand that the Italians will choose the one way, and the Germans the other. What is the Brazilian position? It would be to understand both positions perfectly and admire one as much as the other. This is the stance – as a Brazilian – that I take. In our way of understanding Christmas, we would speak a little less than the Italians and would be a little less silent than the Germans. But, regardless of our personal preferences, we admire the regional varieties through which God desires to be adored by each people. We contemplate the beauty of this grand diversity. I do not know whether the Italians have a most expressive Christmas song. I know many French carols that are very beautiful, but none are as beautiful as Stille Nacht, or Silent Night, which has become the Christmas carol par excellence throughout the world. So, let us prepare ourselves to appreciate this song by imagining a German Christmas night. How does a German understand Stille Nacht? In December 1818, Fr. 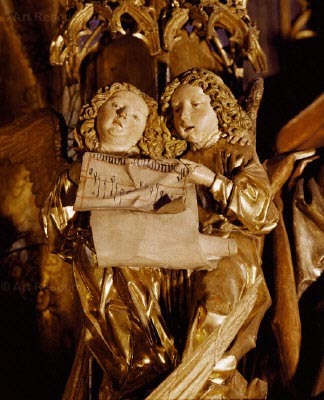 Joseph Mohr, the parish priest of St. Nicholas Church in the village of Obendorf, Austria, went to visit his friend Franz Gruber, a music teacher in the neighboring town of Arnsdorf. He asked him to write the music for a poem he had composed so that it could be sung at Christmas Mass. Gruber, without realizing how extraordinary his work would be, composed a melody that would become the Christmas song for the entire world. It was not immediately recognized as such. Only after many winding turns did the song became known and famous. 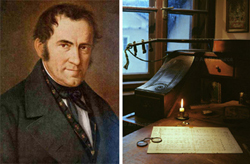 Today, we can visit the house of Franz Gruber in Arnsdorf and see all his belongings. I have seen pictures of them, as well as the charming German village. You can imagine that village with the white rooftops all covered with snow, the little brown houses looking like they were made of gingerbread, the small church glistening like marzipan. It is a charming and very innocent village. Now, imagine a winding path that leads to the Church, with mounds of shoveled snow on either side. Warm light comes from the house windows – with their lace curtains tied back with ribbons, neat and orderly as Germans always keep things. The church bell tolls and families with their children leave their homes bundled up in coats and hats, each person looking like a spool of dark thread on the stark white snow. Carrying lanterns, they file along the path to the church in order to attend Mass. What do these persons feel? The silence of the night with the falling snow is profound; their recollected thought on the way to church causes them to imagine a similar atmosphere in Bethlehem where a great silence surrounded the cave with the Manger. It was an immense recollected silence on the most sacred of nights. At midnight Our Lady and St. Joseph are alone in a stable. St. Joseph is recollected, Our Lady in the highest ecstasy. At a certain moment – no one knows how – the sound of an infant is heard and the Son of God entered this world, preserving intact the virginity of Our Lady before, during and after her parturition. The greatest fact of History has taken place in that Manger. For the first time Our Lady gazes at the face of her Son and tenderly adores Him. St. Joseph is without words. Everything is silent. They do not talk to each other. Thousands of Angels hover around them. Without the sound of a single note of music, a multitude of Angels sing inside that silence. The union of souls of St. Joseph and Our Lady reaches its apex because of the Infant who was born of her, but over whom St. Joseph has the right of father. Indeed, as her legitimate spouse, he has the right over the fruit of her womb, so that even though he is not the natural father, he has the rights of the father. He is from the House of David and it is he who will give his Son the right to bear the name of that House. You can imagine the first time the Infant made a gesture toward St. Joseph, how the Patriarch adored Him and how genially Our Lady handed the Child Jesus to him. It was the first time she exercised her function as Mediatrix, delivering the Child Jesus to a human creature. All this took place in that great silence, interrupted only by the songs the Angels sang to call the shepherds to adore their Savior. It was the music of the Angels coming from the highest heavens announcing that the Infant God was born. It was a music as tranquil, pure and innocent as the natural ambience of those shepherds. Then, the Angels tell them that Christ is born. The shepherds set out for the stable. They see the stars shining with unusual brilliance and think: “What a marvel! This seems more like the sky of paradise than of earth!” They continue calmly on their way toward the Manger, and finally they see Our Lady and St. Joseph together adoring the Child Jesus. Everything is silent, calm, harmonious and stable. The ambience is so angelic that one longs for that night to never end, to die and go from there to Heaven. Nothing more seems necessary. It was this pastoral, angelic, supernatural, familiar and intimate ambience with its great dignity and metaphysical character that the song Stille Nacht wanted to express. You may note that amid the joy of Christmas, the music expresses a nostalgic tenderness. In this nostalgia is a note of compassion. In its festive air there is a note of sadness, which is a sorrow for the cold night air and poverty that surrounds the Child Jesus at His birth. Even more than that, it is a sadness that foresees the Cross. The shadow of the Cross is projected over the Manger. Thus we find a tenderness mixed with compassion for the One who came to be the Redeemer, to suffer and to die on the Cross. Sleeps in a heavenly tranquility. Christ the Savior is here! O Christ, on the day of Thy birth! We see that while it is a very simple song that comes from the people, it has a very profound meaning. Happy the people whose culture permeates everything so that a simple primary teacher of a small village can conceive such wonderful music! Culture is not just to have grand geniuses. A great culture spreads so that marvelous fruits like this unexpectedly bloom in the different levels of society. Is there a lesson here for us, who are Brazilian? 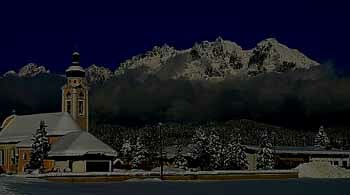 We can benefit much from reflecting on this German Christmas carol and ambience. Very intuitive peoples – like us – are too expansive and, for this reason, easily become agitated. The calm of this song invites us to be recollected, to live a more interior life, to hear the voice of grace in our souls. We should not spend all our time watching others, but rather pay attention to God. This music gives us a masterly lesson on the interior life. It interprets well the grace of Christmas for souls who are not condemned - like so many who participate in the carnival excitement of the progressivist liturgy and the commercial thrills of the store windows in our great cities made of cement. Such souls are far removed from the village of gingerbread houses in the snow whose charm we are enjoying.